In this article, everything nuclear, including missiles, reactors, and radiological weapons will be judged against the backdrop of reality. Since this article will cover a broad range of technology, it is represented in some respect by most of the games throughout the series, but Generals covered the widest range of various nuclear technologies by far. 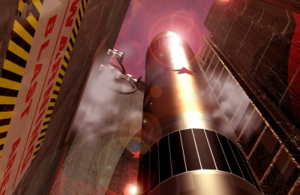 When discussing nuclear technology, it probably makes sense to look at the most predominant form of it first; the nuclear missile, which shows up as one of the available superweapons in most of the games. The missiles themselves, before they have even had a chance to launch, are already unrealistic as they are far too large. The missiles depicted always appear to be intercontinental ballistic missiles (ICBM), which would never be launched from or detonated on a battlefield. The reason ICBMs are so large is because they are basically space rockets with multiple stages that take the payload into a sub-orbital trajectory up to an altitude of about 1200 km (750 mi) with a range of at least 5500 km (3400 mi). Silos even show the missiles flying straight up off the visible map and then straight down over the target as if they actually do reach the upper atmosphere in a complete waste of rocket fuel. ICBMs are also strategic nuclear weapons with blast yields far too powerful to use on a battlefield where your own forces would likely come to harm. Nukes deployed on the battlefield would be tactical nuclear weapons with much smaller yields. Considering none of the nuclear missiles in the games wipe out the entire map, they are obviously only low-yield tactical nuclear missiles. Within cutscenes, possibly as large as 10 kt, in-game, maybe 1 kt on a good day. So just how powerful are tactical nuclear weapons? There seems to be a common impression among players that nuclear weapons should one-shot anything and are too weak. This is simply not true, and could be one of the rare examples where the games are more realistic than people think they are. To understand how powerful a nuclear weapon is, we will first need to examine what actually happens in a nuclear detonation. The first effect is a brilliant flash of energy. You cannot dodge it, because it moves at the speed of light, and is the first indicator that something very bad is going on in your vicinity. The games frequently show the explosion starting before the flash, but this is inaccurate. The second effect is the blast wave, which arrives at the speed of sound. This overpressure front can smash into buildings, flip vehicles, and sandpaper your flesh off with debris. Then there is the insidious radiation, which hits almost instantaneously in the form of gamma rays, to taking days to arrive as nuclear fallout. The final effect is three forms of electromagnetic pulse, which the games pretend doesn’t exist in nuclear explosions and prefer to put in non-nuclear devices instead. The flash is mainly just light, ranging from infrared to ultraviolet, though intense enough to start things on fire, it can be easily blocked by anything opaque. Fires are often short-lived in a nuclear explosion too, since the blast wave typically puts them all out once it arrives. The blast wave can easily harm troops standing out in the open, but would do little to heavy tanks other than possibly stripping off their communications antennae. Light vehicles might come to more harm, but you’d have a pretty good chance of walking away unscathed from an unprotected truck at only 500 m (1640 ft) from ground zero in a 1 kt detonation. This brings us to radiation. Radioactive material could be thought of as a balance between two variables, length it remains radioactive and how much radiation it is emitting, increasing one variable decreases the other. So that material too dangerous to come anywhere near is not going to remain dangerous for an incredibly long time, and conversely, material that will be around for an extremely long time is not as dangerous. While this means walking around in the crater of a nuclear bomb site a few years later will be relatively safe, the time scales of a battle in the games are still too short for the area to become safe. 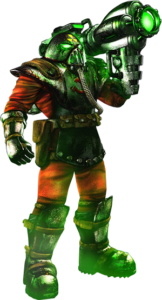 For gameplay reasons, it is understandable that radiation disperses quite quickly however. These two variables can be taken advantage of, with depleted uranium on one side of the scale that primarily consists of U-238 with a half life over 4 billion years, and neutron bombs on the opposite end that are designed to intentionally release short-lasting bursts of very high level radiation. Unfortunately, while both of these appear in Generals: Zero Hour, neither are very realistic. With the Uranium Shells upgrade, Chinese tanks leave tiny puffs of radiation with every shot. Depleted uranium projectiles are indeed radioactive in the real world, but at a level so low as to be negligible during battle. Compared to the Neutron Shells and Mines however, the Uranium Shells are super realistic. Real neutron bombs are a variant of hydrogen bomb with very low yields, within the 1-10 kt range. In normal hydrogen bombs, about half of the energy released is in the blast with the rest distributed over the flash and radiation. A neutron bomb converts some of the blast and flash energy into more radiation, but it still releases about a third of its energy as blast, so real neutron bombs would remain highly destructive weapons. 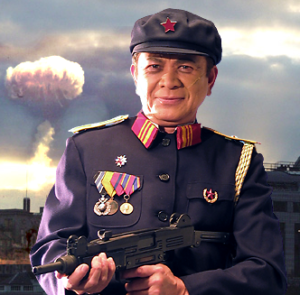 In fact, with low-yield explosions and short-lasting, very deadly radiation, the regular nuclear missile superweapons in Red Alert 2 and Generals resemble a more accurate portrayal of neutron bombs. When the Chinese Nuke Cannons aren’t firing their Neutron Shells that look closer to flash grenades than nuclear explosions, they can fire miniature nuclear bombs. Similar nukes can also be used by several of General Tsing Shi Tao’s units. These tiny nuclear explosions appear to be yields about 1% the power of the smallest nuclear bombs ever made, which were small enough to be carried by a single man in a backpack. It is not possible to actually produce nuclear weapons with yields that low, as they would lack sufficient material to reach the critical mass required to initiate the nuclear reaction. Even if a nuclear bomb that small was possible, it would be too small to form a mushroom cloud as well, since mushroom clouds are actually just the result of a very large explosion, the cause of the explosion having little to do with it. The real nuclear device that created the mushroom cloud visible in the Nuke Cannon’s portrait had a yield of 15 kt. It was an artillery shell fired from a cannon, so there is no reason why the game units would need to use such tiny weapons, except for the Helix, as dropping a nuclear bomb with just about any realistic yield from a helicopter would be suicide. If suicidal attacks are acceptable, the fully nuclear Demolition Truck from Red Alert 1 would be a plausible delivery method, aside from trucks being very vulnerable, relatively slow, and a waste of resources. A truck-based nuclear explosion would be near enough to the earth to be considered a ground burst explosion. Air bursts are more efficient, except against subterranean targets, and produce less fallout. Cleaner explosions are desirable in tactical nuclear weapons, not for humanitarian reasons, rather because nuclear fallout is bad for both sides. The reliability would also be questionable, as nuclear bombs require a very precise sequence of events to occur to successfully detonate, if the truck was under enemy fire, any damage to the weapon itself could prevent it from operating properly and turn it into an expensive dirty bomb instead. 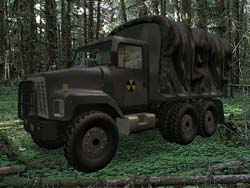 The Red Alert 2 Demolition Truck appears to just be a dirty bomb instead of a nuclear weapon. This would probably be the wiser choice. The final nuclear technology to cover will be nuclear reactors. 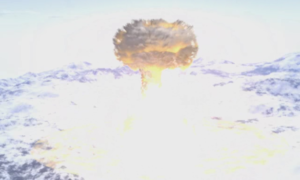 Both the Red Alert 2 and Generals reactors explode into nuclear mushroom clouds when destroyed. This scenario is not possible. Nuclear reactors do not use weapons grade nuclear material, they cannot attain critical mass under the best of conditions and will not explode. An explosion from another source can fling the radioactive contents around, making them into an oversized dirty bomb like the steam explosion at the infamous Chernobyl incident, but that is the extent of their exploding capabilities. The Cold Fusion Reactor does not explode or even fling radioactive material around when it is destroyed. This is actually accurate. Aside from the cold fusion part, since cold fusion is about as realistic as Yuri going back in time to the Maastrichtian Age and getting eaten by a t-rex. Although fusion does use radioactive material, it does not require very much to be stockpiled and it is just hydrogen gas that would drift away if the structure was blown up. Unlike fission reactions, fusion reactions can be stopped at any moment, so there is even less risk than blowing up a fission reactor. As an aside, since fusion is easy to stop, a fusion reactor would not need Control Rods, those are a feature in fission reactors and don’t make sense in a fusion reactor. Red Alert 3 didn’t feature nuclear technology due to the erasure of Einstein from the timeline in 1927. On the surface, this makes some sense, as it was the Einstein–Szilárd letter, signed by Einstein and delivered to US President Franklin Roosevelt in 1939 that prompted the president to initiate the Manhattan Project. However, atomic weapons were already in some sort of development by every major power at the time and were an inevitable technology. At best, removing Einstein could have merely delayed it. Of course, nukes didn’t seem to stay missing from the timeline for very long, since the eighth Allied mission tasks the player with stopping Kirovs carrying 50 Mt bombs. Considering 50 Mt is over one million times more powerful than the largest non-nuclear bomb in existence and equal to the largest nuclear bomb ever built, it seems fairly obvious what the Kirovs are really carrying, even if it is never explicitly stated.